Munstead: This is a good cooking lavender with a nice flavor. It’s relatively easy to grow. It’s more petite than most lavenders, reaching only one to two feet tall. Its purple blooms are more open than most other types of lavender. Hidcote: This lavender is wonderful for crafts such as wreath-making or dried flower arrangements. Its buds dry to a lovely deep purple and are known for staying on the stems. 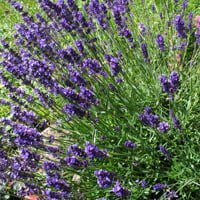 This is also a shorter lavender, with a mature height of 12″ to 15″. Coconut Ice: This English lavender is also popular with decorators because of its soft-pink blooms that fade to white, and its silvery foliage. Combined with other types of lavender, Coconut Ice can form a striking multi-colored bouquet. “True” Lavender: This is Lavender angustifolia with no subtype. Its mature height is 24″ to 36″, and it is hardy in zones 5b to 8a. It is excellent as a garden shrub, border plant, or for landscape massings. Its sweet smell is both soothing to your guests and unattractive to deer, which makes lavender a great companion plant for roses or other treasures. White Grosso Lavender: This evergreen shrub grows to two to three feet tall and produces beautiful white flowers that stay snowy even after drying. It’s hardy in zones 5 through 11. Grosso Lavender: This evergreen shrub needs little water, and produces lovely purple flowers. It also produces lots of heavenly-smelling oil, so this is the perfect plant to get if you want to make soaps or other lavender essential oil products. It’s hardy in zones 5 through 11. Provence Lavender: This evergreen shrub grows to a mature height of two feet and has sweet-smelling purple flowers. Provence lavender’s buds are very easy to strip, so this lavender is perfect for making sachets or potpourri. Whichever type of lavender you choose, this multitasking bloom is sure to satisfy your eyes, your nose, and your taste buds! *Note: Never eat lavender from a flower shop. If you plan to grow lavender for consumption, don’t use any poisonous insecticides or other dangerous products on your lavender.